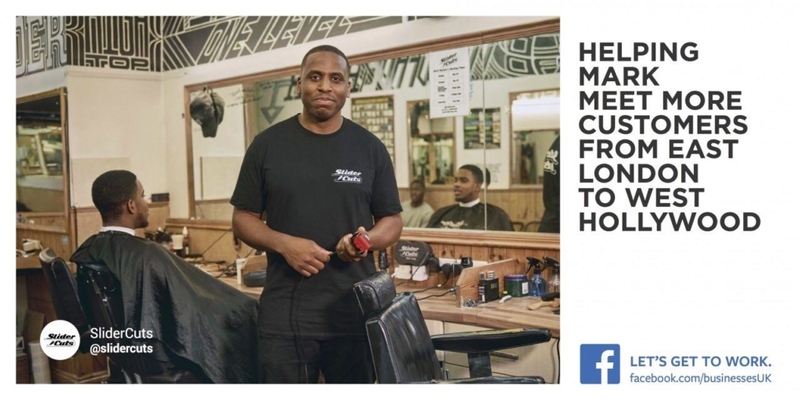 Master barber SliderCuts has landed a lead role as one of the featured businesses in a UK-wide Facebook advertising campaign, “Let’s Get to Work”. Launched at the end of January 2018, the campaign highlights small and medium UK brands and the work it takes to own and run a business. It puts SliderCuts in the cut, alongside featuring a number of small businesses, to show other business owners how they can use Facebook to meet and stay connected with even more customers around the world. The eight-week multifaceted campaign is fronted by a 60-second hero film, narrated by Game of Thrones actor Kit Harington. “Let’s Get to Work” features clips of traditional businesses’ hard-working routines, which includes SliderCuts working business-as-usual at the animated D&L’s barbershop, packed with the shop’s many regulars. Spanning outdoor, TV, print, online and cinema, the campaign features 16 small and medium businesses in total. With “Let’s Get to Work”, Facebook hopes to shine a light on investment in these types of local enterprises, as well as the depth and diversity of their business models.